Wireless Bluetooth Headphones Ultra Thin Lightweight & Comfortable Headband. Condition is New. Shipped with USPS Priority Mail. Lightly used. In great condition.It is missing the charging cable and adapter for the headphones. Tested and works great. A family physician pioneered SleepPhones to help patients fall asleep faster and stay asleep longer naturally & without drugs. ONE YEAR WARRANTY. CHOOSE YOUR SIZE, FABRIC & COLOR. Both options feature our pre-shrunk, nonpilling SleepCloud fabric. SleepPhones Classic Headphones | Ultra Thin Speakers in. NO MORE EARBUD POWER STRUGGLES: SleepPhones stay put so you can stay asleep! Simply plug in & relax. | I no longer take sleep aids! Want to comfortably listen to audio in bed without disturbing who's next to you?. Drown out snoring partners or noisy neighbors?. 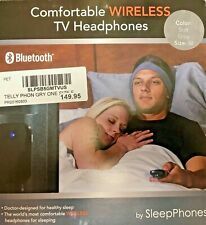 Then SleepPhones Microphone truly are "Pajamas for your ears®!". Our patented "headphones in a headband" design secures ultra-thin traditional stereo headphones inside a soft, stretchy headband. ® technology to wirelessly connect with compatible devices so you never have to worry about getting tangled up in cords. ® Wireless are traditional headphones made bed-friendly and cord-free! Unplug and unwind with our ultra-slim, patented soft and comfortable “headphones in a headband” that make listening to audio in bed a dream. CHOOSE YOUR SIZE, FABRIC & COLOR. Both options feature our pre-shrunk, nonpilling SleepCloud fabric. Choose from a variety of attractive colors, too! ENGINEERED & DESIGNED FOR COMFORT. The high-quality, ultra-thin flat headphone speakers are comfortable enough to wear while lying down or sleeping on your side. Barely used SleepPhones. Good for listening to music or meditation before bed. Comes in original paperwork and headband with Bluetooth speakers. You can use any micro USB to charge. When I purchased, I opted for 'eco-friendly' packaging and therefore, there is no original box. The headphones have been tested and are functional. Battery life has not been tested. SleepPhones are the world's most comfortable, bed-friendly headphones. SleepPhones provide a safe and natural way to fall asleep without bulky headphones or painful earbuds. SleepPhonesÂ® Classic provides superior sound quality with eco-friendly, lead-free electronics. Like to listen to music in bed?. SleepPhones by AcousticSheep are the most comfortable headphones to wear to sleep all night long. Regular headphones and ear buds are bulky and painful for side sleepers. PERFECT FOR YOUR FAVORITE WORKOUTS & MORE. RunPhones Wireless are made for running, cross training, boxing, yoga, and more because they keep hair and sweat out of your face with no cords in the way. WIRELESS BLUETOOTH CONNECTIVITY & LONG LASTING BATTERY. The headband headphone has Bluetooth technology to wirelessly connect with compatible devices so you never have to worry about getting tangled up in cords. WIRELESS BLUETOOTH CONNECTIVITY, LONG LASTING BATTERY, & CORDLESS INDUCTION CHARGING. The headband headphone has Bluetooth technology to wirelessly connect with compatible devices so you never have to worry about getting tangled up in cords. Wireless are the first wireless headphones specifically designed for use in bed. Wireless are lightweight and pair easily with any smart phone with Bluetooth?. technology or even computers and tablets. JDM Fujiyama japan. JDM Fujiyama japan is highly appreciated. JDM Fujimama japan can be found soon. And I will propose to you. EMS US 18.2 US 18.2 US 20 US 21.8. Enjoy a comfortable life with Japanese products. It was developed by a US specialist who is studying about comfortable sleep. A high-quality thin speaker is built in a soft and comfortable material headband. Ultra-thin "headband headphones" (patented) that you can listen to music comfortably in the bed. To listen to music in bed?. SleepPhones by AcousticSheep are the most comfortable headphones to wear to sleep all night long. Regular headphones and ear buds are bulky and painful for side sleepers. TRAVEL, INSOMNIA, TINNITUS. Everyone from shift workers, snoring spouses, tinnitus sufferers to those looking to increase athletic performance have benefited from getting a better nights sleep by using Acoustic Sheep Headphones. AcousticSheep SleepPhones Classic Sleep Headphones Medium - One Size Black CHOOSE SIZE COLOR. Sizes XS, M, XL. Size Medium, M is the most common size, this size fits most. Colors soft gray, quiet lavender midnight black.NATURAL SLEEP AID. Invented by a family doctor, with the aim to help patients fall asleep faster, stay asleep longer, naturally without drugs. SleepPhones come with a 1 year manufacturer's and satisfaction guarantee. The original most comfortable bed-friendly headphones on the marketENGINEERED DESIGNED FOR COMFORT. The ultra thin 4 mm flat headphone speakers are comfortable to wear laying down or sleeping on your side. They block out ambient noise without using earplugs that are painful fall out. The durable 48 inch cord allows multiple options in where you place your chosen device whilst sleeping. NATURAL SLEEP AID. The original & most comfortable bed-friendly headphones on the market. TRAVEL, INSOMNIA, TINNITUS. Everyone from shift workers, snoring spouses, tinnitus sufferers to those looking to increase athletic performance have benefited from getting a better nights sleep by using Acoustic Sheep Headphones. Like to listen to music in bed SleepPhones by AcousticSheep are the most comfortable headphones to wear to sleep all night long. Regular headphones and ear buds are bulky and painful for side sleepers. SleepPhones by AcousticSheep are the most comfortable headphones to wear to sleep all night long. Regular headphones and ear buds are bulky and painful for side sleepers. 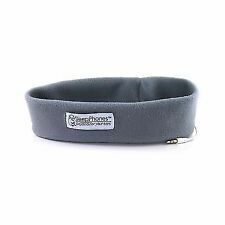 Lightweight and washable, the wicking fleece SleepPhones headband contains thin removable (and replaceable) speakers. BREATHABLE, COOL, HYPOALLERGENIC. 95% polyester, 5% spandex. The headband can be pulled down over your eyes as a sleep mask whilst you listen to soothing tunes, bin-aural beats, a podcast or e-book.